Amy, U Try It, warns that these cookies are addictive. After I ate the first one I thought, hmmm they’re pretty good – crispy and crunchy with a nice almond flavor. Then a little while later I found myself craving another one, and then another, and then another. These are such a pretty cookie too. As soon as I saw them, I wanted to make them. Apparently they sell them at Chinese bakeries, but I’ve never been to a Chinese bakery and they were new to me. The original recipe said it made 42 teaspoon size cookies, but I was too impatient to make them that little and I use my littlest cookie scoop instead. I only got about 2 dozen cookies. These would be the perfect dessert after a wonderful Asian meal. I also thought they were the perfect cookie to start my annual 12 Weeks of Christmas Cookies posts. 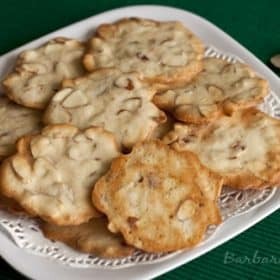 Once again, I’m joining other talented food bloggers who will post a new holiday cookie or other sweet recipe every Thursday for the next 12 weeks. Hopefully, we’ll all end up with some great ideas and fabulous cookies to give away to friends and family for Christmas. Can you believe Christmas is only 12 weeks away? 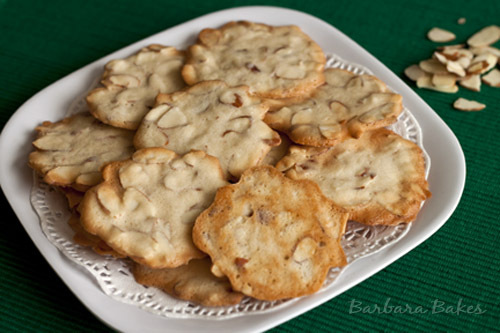 Thanks Amy for sharing your Almond Cookie Crisps recipe. Stop by U Try It to check out all of Amy’s delicious recipes. Preheat oven 325F. Line baking sheet with silicone baking mat or parchment paper. In a small mixing bowl, beat egg white, salt, vanilla extract and sugar until foamy. Whisk until sugar is completely dissolved. Whisk in flour until no lumps. Then, gently fold in almond slices and butter. Bake 9 to 12 minutes depending on their size, rotate baking sheet once during baking. Bake until slightly golden brown. Remove from baking sheet and cool completely on wire rack. 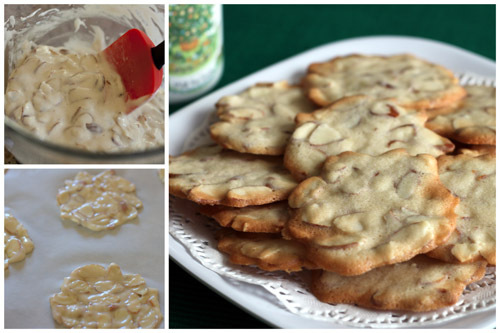 Cookies will crisp up once completely cool. 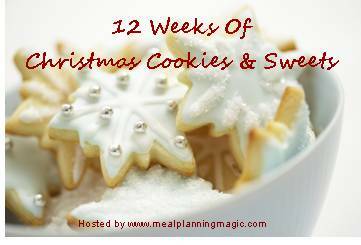 If you’re interested in joining us for 12 Weeks of Christmas Cookies contact Brenda, Meal Planning Magic, mealmagic at gmail dot com. Be sure and check out all of the fabulous cookies the other 12 weeks of Christmas Cookies bakers baked up for this week. I love the way the almonds shape the cookie. They look like flowers! OOOooooH! I’m very excited about these – LOVE almonds in everything! Oh my goodness – I can’t believe it’s already 12 weeks to Christmas!! These look fantastic – a great way to start! I can believe that these are addictive. They would be wonderful as a tea time snack – though I have a feeling I couldn’t stop at just one.